Ok I decided to carry a service of all the Filters including the replacement of the Oil. What could go wrong changing the Engine Oil and Filter (2), Air Filter (3), Pollen Filter and Fuel Filter (1) ! 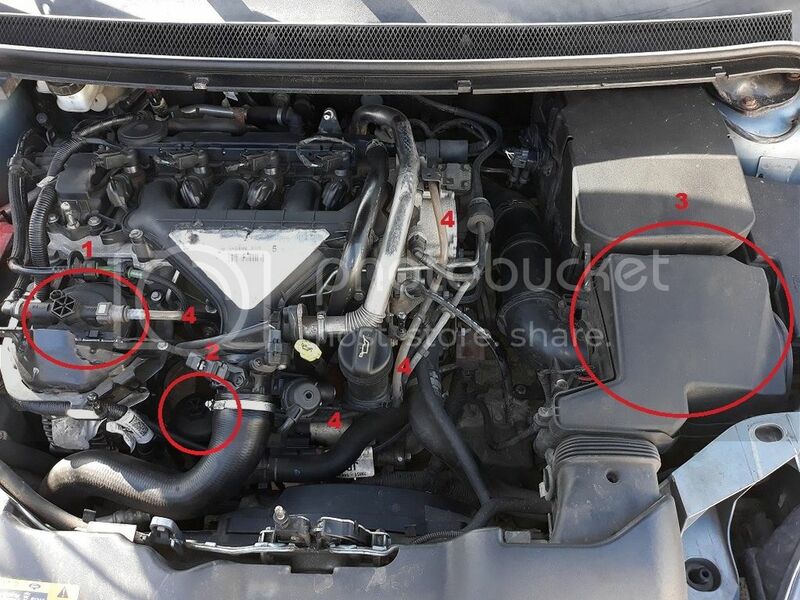 4 indicates the route of the OUT transparent hose to the fuel filter. Well the Engine and Oil Filter went incredibly easy, only issue was the replacement Sump Plug (Bolt-Allen Key) was the wrong size, easily remedied. The Air Filter again was relatively easy, the base forming part of the external wall of the enclosure to which it fits. The Pollen filter fiddly but achievable. So this brings me to the Fuel Filter. Changing it was simple, attacked it in the same way as the Mondeo Mk3 Tdci I had. Went to start the Engine a few moments of glory but Arghhhhhh! Dead Car! This Model needs to be primed in one manner or another, in so much that there needs to be fuel from the IN (Fuel Supply) to the filter housing and fuel in the OUT (transparent hose) to the Fuel Pump, ensuring that any air from the Filter housing has been bled. This is achievable via the top valve on the filter housing. Well, I purchased a Draper Diesel Priming Pump, an absolutely useless tool, the only advantage was an upper arm the size of Arnold Schwarzenegger through the constant pumping and very little fuel delivery! So I resorted to ensuring the Fuel Filter Housing was full as well as the filter itself before re-tightened. The OUT Valve (Transparent Hose) to the Fuel Pump, I needed to un-route and hold aloft to allow all the air to escape. I then filled this with fresh diesel, and replace along the same route back to the OUT valve on the Filter, topping up before attaching. The Car needed to be Jumped by another car as by this stage the Battery Cold Cranking had given up its challenge (Note: The negative terminal needs to be connected to the earth connection on the top-strut of the car NOT the battery terminal). This took several attempts to turn over where I nearly gave up. However, it then burst into life. Kept the Revs at about 2500-3000 rpm for about 3 mins. Detached the battery leads and took her for a 10 min drive. Following morning, drove into work as if nothing had happened. Success and a huge feeling of both achievement and relief that those earlier pounds signs did not emerge! Ok, not a great way but a few lessons learned and some horror stories avoided so next time will be easier. The Main point for me is to resist the urge of changing the filter and starting the car immediately! Now i'll ensure that fuel gets to the filter and to the pump, ensuring that it is 'air'/'bubble' free and make use of the bleed valve on top of the filter housing (Using this to top-up the fuel and allowing air to escape). to do it by following your guide. Way to go mate and even though changing the fuel filter was a pain you can chalk it up to experience and are now that bit wiser .